Occupational therapy (OT) enables people of all ages to enhance their lives by participating in everyday activities while enhancing development and function. Occupational therapists are trained to look at a person holistically to improve overall quality of life. Pediatric Occupational Therapists focus on promoting function and engagement of infants and toddlers and their families in everyday life. Family centered care is imperative as the child needs to feel comfortable in their environment. Occupational therapists support family members and caregivers to ensure a child’s participation in home and community life. As children learn best through naturally occurring experiences, therapists incorporate activities of daily living (ADL) into their treatment. Such ADL’s for children are play, education, eating, and dressing. These ADL’s fit into areas of development that include physical, sensory, communication, cognitive, adaptive, self-care, and social-emotional domains. Pediatric Occupational Therapists bring specific knowledge and expertise to appropriately address each child’s individual needs. Who do pediatric occupational therapists help? Many kids will see an occupational therapist for a variety of reasons. Most have difficulty completing things that they do every day. These activities might include dressing, staying in his/her seat or sitting upright at school, feeding themselves, paying attention, turning pages of a book, writing, cutting with scissors, or coloring in the lines. 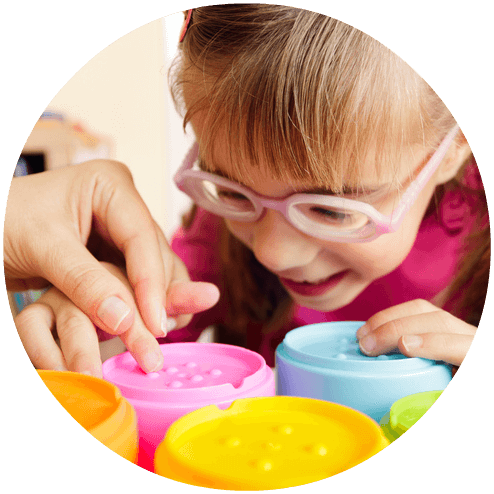 Other children may have a diagnosed condition such as cerebral palsy who will find daily activities more challenging. Contact us and learn more about how we can partner with you and your child to enhance their potential for growth, development and independence. We work with families throughout Raleigh, Durham, Chapel Hill and the surrounding areas in North Carolina.